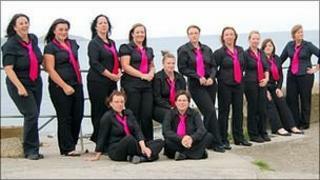 Cornwall's first ever all-female brass band are getting ready for their debut performance. Wonderbrass is made up of experienced members from different brass bands based in the county and the only male is their musical director Derek Greenwood. The group has a varied age range with some of the members performing brass band music in the county for more than 20 years. Insisting he was undaunted by the task, Mr Greenwood said: "I'm the only one they could get! "Nobody else would take the chance. I said I don't want no fuss, I don't mind sharing a changing room." Band members are hoping to recruit young women who play and polish up their brass skills. Bev Bennett, an E flat bass player, said: "We've learnt our trade. We can give that back to the younger generation as they come up through." Wonderbrass will be playing their debut concert, a sell-out charity event, in St Austell, on Saturday.